These Rice Krispie Treats are the BEST! This recipe turns out huge, perfectly soft and gooey rice krispie treats with extra non-melted marshmallows mixed in! Line a 9x13-inch baking dish with foil, then coat with non-stick cooking spray; set aside. In a large saucepan or stockpot, melt the butter and 16 cups (680 grams) of the miniature marshmallows over low heat until the marshmallows are just melted. Stir in the salt and vanilla to combine. 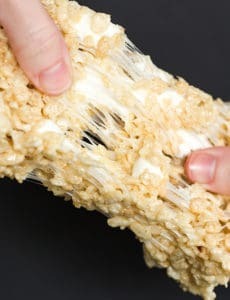 Remove the pan from the heat, add the Rice Krispies and mix until it is completely and evenly coated with the marshmallow mixture. Stir in the additional 4 cups of miniature marshmallows. Turn the mixture out into the prepared pan and, using a wooden spoon or spatula that has been coated in non-stick cooking spray, press the mixture firmly into a packed, even layer. Allow to set at room temperature for at least 30 minutes. Using the foil, remove the treats from the pan and slice into squares. Leftover rice krispie treats should be stored in an airtight container at room temperature for up to 3 days. To help with your grocery list, you will use three (10-ounce) bags of miniature marshmallows for this recipe. You can omit the extra marshmallows that get stirred in at the end if you wish. You do not need to make any adjustments to the recipe. You can make rice krispie treats with marshmallow fluff if you'd like. You will need to substitute four (7.5-ounce) jars of marshmallow fluff for the 16 cups of miniature marshmallows that are called for in the recipe. Heat the marshmallow fluff with the melted butter over low heat and proceed with the recipe as directed. How to Store Rice Krispie Treats - They are best stored at room temperature in an airtight container to keep maximum freshness and softness. You can go one step further and wrap them individually in plastic wrap to keep them REALLY fresh. I do not recommend refrigerating them, as they become hard and lose moisture. If you want to freeze them, wrap them individually in plastic wrap and place in a freezer ziploc bag and freeze for up to 2 months. Allow to thaw at room temperature.